While processing the pictures from our Texas birding trip back in November 2013, I came across these shots. At first I wrote them off as female Mallards … well, because just about all ducks with drab female coloring look like… female Mallards. It can be as painful as trying to identify juvenile Sparrows if you do not get lucky enough to capture a nearby male. While processing them in the digital darkroom I became quite intrigued. For some reason they just didn’t look like the standard Mallard or any other female brown duck that has made their way through the darkroom in the past. I guess for starters, they didn’t have the classic colored stripe on the wing. Then there was that small black splotch on the base of the bill. That prompted a visit to the reference bookcase. Confirmed the wing stripe on the Mallard and sure enough no black splotch on the base of the bill ladies and gentlemen, this just might be a new check mark in the bird list! It just so happens my brother Ron had recently brought up the topic of the Mottled Duck. Unfortunately, the reason escapes me – he might have gotten one in the tin on his trip to Ft Myers (went back in my emails and couldn’t locate a reference – Ron, if you remember please let us know in the comments). Either way, I was super stoked to potentially have one of my own so sent them off to Ron for validation. He is a great reference whenever there are difficulties on the ID phase. His assessment was a confirmation giving me another +1 for my list and ANOTHER +1 from my Texas trip. That birding excursion is turning out to be a gold mine for new birds. Sorry about taking so long to get these processed. Unfortunately, these were the only shots of these two Mottled Ducks in the lot. This means we need to get to the facts like right now hehehe. The Mottled is a dull relative of the Mallard which attributes to the similarities and my original incorrect ID assumption. There really isn’t much else of interest on the Cornell site beyond the fact they typically pair up in November which is earlier than most ducks. Seeing as how we were there in mid-November, these two must have been embarking on their honeymoon. Lastly, if you are curious, Mottled simply means having different blotches of color. Well, that’s all folks – hope you enjoyed my new addition to my bird list. Now be safe on the roads if you are out and about on the big T-Day. I can’t afford to lose any loyal readers. 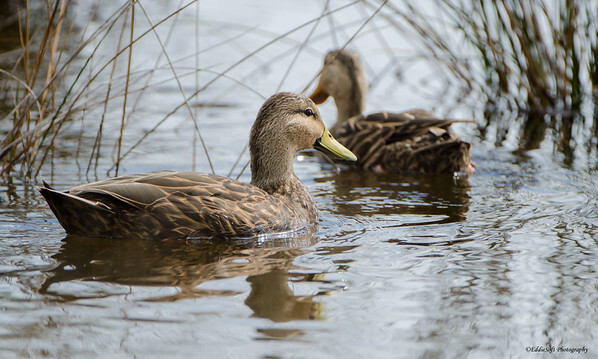 Yes, I got pics of Mottled Ducks in Fort Myers last May. 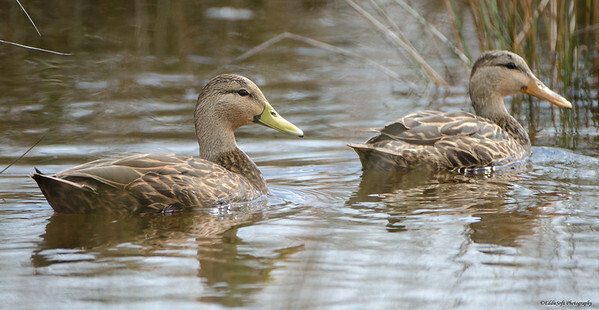 Somehow someone, maybe the birder who asked me about Fort Myers and was down there for the month of January, mentioned Mottled Ducks and I looked them up. Otherwise, I would have assumed they were Mallards as well. Sheer luck. I also have pics of American Black Ducks. They also look like Mallards but have blue secondaries (speculum) that are iridescent purple like the blue of Mallards, but *without* the white borders of Mallards. If you don’t have that bird yet, look them up and keep an eye out for them in your pics as they are quite spread out, unlike Mottled Ducks which are only in Florida and along the Gulf Coast. I bet you have some of these in your tin. These three photographs are exquisite, particularly the middle one. I wonder if there is a significance (say, gender) to the different shades of the bills. I’ll check on the Black Duck – would be awesome to have another new bird already in the tin. I will also keep an eye out for them when processing all the shots from our recent trip to Texas. By the way, I have a lot more shots of the Mottled now from our visit to the South Padre Island refuge – they were everywhere at that spot (the shots here were the only three I got on the first trip). There is a gender specific aspect of the bill – a bird guide was giving an overview of them to a group of people he was leading and mentioned something to that affect – can’t remember what he said at the moment – I will check out my reference books and see what they have to say..
Next Next post: Happy Thanksgiving Everyone!